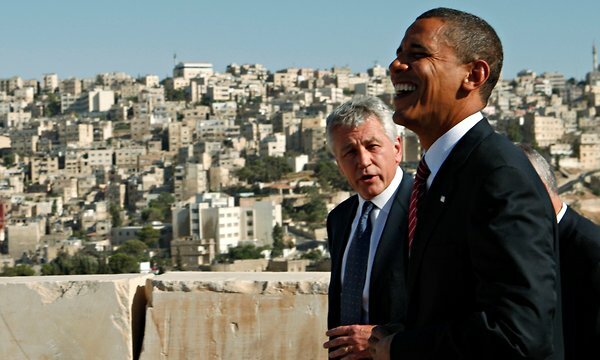 Obama and Hagel at the Amman Citadel in Jordan in July 2008. Photo courtesy of Jim Young/Reuters. Sunday morning brought news of President Obama's next pick for the White House Defense Secretary: Chuck Hagel, twice awarded a Purple Heart, and both a former Vietnam veteran and Republican senator from Nebraska. Democratic officials say that the formal announcement may come as early as Monday, January 7th. However, Hagel will find some scrutiny during his Senate evaluation with his uncharacteristic views on Israel and military spending. Various Republican figures have already noted their disapproval. Any nominee must have a full understanding of our close relationship with our Israeli allies, the Iranian threat, and the importance of having a robust military. Hagel has certainly been outspoken in foreign policy and defense over the years. The question we will be answering, if he's the nominee, is do his views make sense for that particular job? Hagel is an antagonistic figure when it comes to the state of Israel. It's a signal you're sending to Iran at the worst possible time and to our allies. What exactly has Hagel done to fire-up prominent conservatives? Specifically, he has publicly shared his concerns with an American or Israeli nuclear strike on Iran, and encouraged bringing Iran to peace talks with Afghanistan. I'm not an Israeli senator. I'm a United States senator… I support Israel, but my first interest is I take an oath of office to the Constitution of the United States, not to a president, not to a party, not to Israel. If I go run for Senate in Israel, I'll do that. This statement is a total turn-off for Republicans, but perhaps this different approach to foreign policy is exactly what the president is looking for in a defense secretary. He described Hagel as "a patriot who has done extraordinary work" on NBC's "Meet the Press" last week. a decorated war hero who would be the first enlisted soldier and Vietnam veteran to go on to serve as secretary of defense. He has been a champion for troops, veterans and military families through his service at the VA and USO, and his leadership on behalf of the post-9/11 GI Bill. The president knows him well, has traveled with him to Iraq and Afghanistan, trusts him and believes he represents the proud tradition of a strong, bipartisan foreign policy in the United States. It seems that Democrats are supporting the Republican nominee, whose non-typical foreign policy stances are undergoing a bashing by his own party. Do you agree with President Obama's thinking behind nominating Chuck Hagel? Could a "strong, bipartisan foreign policy" be what's needed for his second go-around?